8 days | From 16450RMB/pers. White sand, blue water, green resort. Enjoy one week in Miniloc Island Resort, near El Nido, in the Philippines. This is a top destination for marine and wildlife reserve. Find enchanting lagoons with tranquil turquoise-green water. 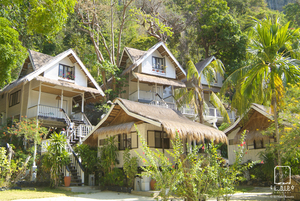 Appreciate thatched-roof cottages made from local materials, a fine white sand beach lined with coconut trees which make El Nido Resorts Miniloc Island a perfect tropical island retreat. Fly with Philippines Airlines from Beijing at 12:55 pm and arrive in Manila at 05:45 pm. Arrive at Diamond Hotel 5* in Manila, located along the scenic Manila Bay area, which is only minutes away from the international and domestic airports. Spend the night in a Superior Room and free use the swimming pool and outdoor whirlpool. Fly to El Nido at 07:30 am, then take the boat and arrive in the Resort. Reminiscent of a coastal village, Miniloc’s quaint charm is enhanced by its crystal clear waters teeming with tropical fishes. The Miniloc Island Resort proposes Garden or Cliff Cottages which are air-conditioned and have a mini bar, a hair dryer and private toilet, shower facilities and private verandahs that offer views of the cove and the nearby islands. All the meals are served by buffet-style. 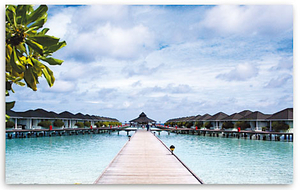 The resort offers a wide range of activities, from soft adventure sports to more leisurely pursuits. All activities are arranged according to your preferences : - Trip to Small and Big Lagoon - Cave exploring - Indoor sports : darts, table-tennis, parlor games and pool table - Island hopping - Picnic at the beach - Playground for children - Beach volleyball - Basketball court - Fishing. On day 7, go back to Manila at 05:00 pm and spend the night. Hi Cindy! Everything was súper! Maybe the worst was the long long trip... But everything ok and the place divine! Thank you!